Ok, so it might be a little early for me to be thinking about retirement (I wish!) but the time is right for many, As we head towardsd the new year, it might be time to start looking for places to retire and enjoy the rest of your life without any stresses or worries here in good ol’ Blighty. Retirees can look forward to decades of active living, but the big question is – where? With the help of Stagecoach, providers of London bus timetables, I’m looking at some of the best hot-spots for retirement in the UK. The South West has the largest retirement percentage with 19.6% in total. And why not? I totally fell in love with Cornwall when I visited earlier this year. In a close second was Wales, with 18.4% and then the East of England with 17.5%. The top three retirement regions are in the south of the country and I’d love to find out why these are the best places to put your feet up. In fourth place came the North East, with 17.3%. In fifth place the South East region came in with 17.2% of retirees. Hot on their heels are the East and West Midlands, the East Midlands (my home!) had 17.1% of retired people whereas the West Midlands had 16.9%. In eighth place came Scotland where around 16.8% of workers retired. From the North West which scored a 16.6% of retirees, and downwards there’s a continuous drop in the percentages of retirement hotspots. Yorkshire and The Humber had the same as Scotland, scoring 16.6% which was followed by Northern Ireland with 14.6% of retirees and finally, London with 11.1% which is maybe slightly hectic when you’re looking to live a more chilled life. Overall, 16.4% of the UK is retired and longer living is the cause of this. As 65 was once the retirement age for workers in the UK, at the time, 9.2million across both England and Wales are over the age of 65 leading to a one in six people over the age of 65 rate. However, the retirement age is on a continuous climb and currently stands at 67. The options are endless when it comes to retirement, from city spaces to rural areas and even seaside locations especially if the retiree has invested in a Self-directed IRA with companies like quest as they can invest in real estate – there are plenty of hotspots here in Britain that will make your retirement more enjoyable. In my list, I’m looking at which factors contribute into making this a great place for retirement, from activities in the area, transport links and the community. This is one popular location for people moving swiftly into their retirement as it’s pretty idyllic. With Georgian architecture throughout the city, it’s definitely a place with a lot of culture and art attractions to visit. There are a lot of markets that are held in Chichester, bringing the residents together on a regular basis and promoting that community spirit. With this being in the south, it has great transport links to London and Gatwick, allowing those in retirement to venture in and out of the capital if they want to immerse themselves into a busier culture or to even jet around the globe on their next holiday. Retirement shouldn’t stop you travelling, if anything it should encourage you to do more! If you’re looking to add a bit of colour to your retirement years, there’s no better option that Cromer in Norfolk. With the sandy beaches and light blue ocean reflecting onto the colourful buildings in the town, you’ll wake up with a smile on your face every morning. 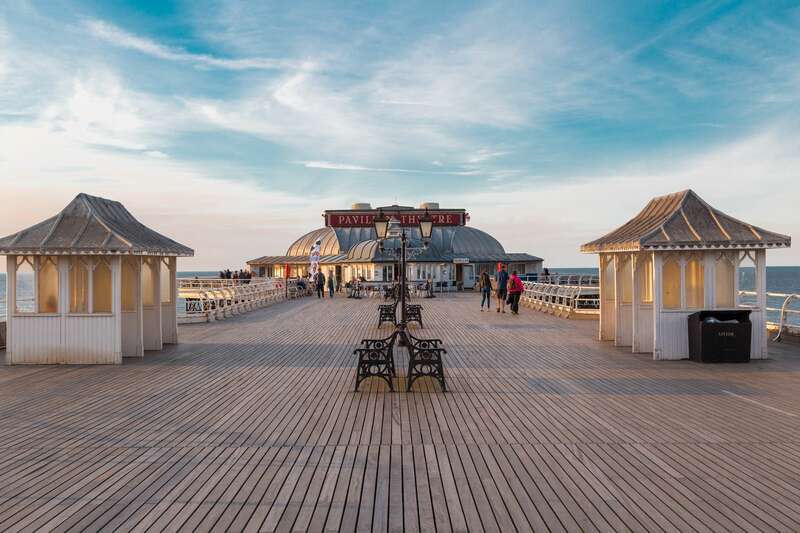 This town is famous for its long pier which is home to the Pavilion Theatre. The theatre has regular productions highlighting its enthusiastic arts culture with productions from all over the country – you don’t need to be in London to see high quality productions! This town has great transport links in and out of Norwich with buses and trains. If you’re looking for a place full of friendly faces, Newcastle upon Tyne might be your best bet! Named ‘the happiest place to live in the UK’ by the European Commission, there’s no reason why you wouldn’t be able to love your days of relaxation in this city. Whatever you’re interested in, the chances are that Newcastle has it – from the Baltic Art Centre to over 300 cafes and pubs and over 92 parks and churches to visit during your time off. If you’re looking to venture out of the city, whether this is abroad or to other places in the country, there’s Newcastle Airport that does both long and short haul flights, as well as Central Station that sits closely in the city for anyone wanting to travel by train. What makes a happy retirement? There are lots of things that can contribute to a happy retirement. One of the main factors is affordability – you want to enjoy your retirement and not have to worry about having spare money to spend after paying your bills. So make sure you plan ahead, saving and investing for your retirement should ideally begin as soon as you start earning. Especially now with the wealth of software and knowledge at your fingertips. Using tools like Stocktrades you can make informed financial decisions regarding your stock portfolio to best achieve your financial retirement goals. After all you want to make sure that you can lead your life and not worrying about the cost, so you can enjoy the things you always have. Be sure to consider the amount of activities that are available in the place you want to retire too – will there be enough for you to do? For help in planning your finances in readiness for retirement, there are a number of Financial Planners who could lend a hand.